What happens to those old great cars we loved so much but we finally got rid of because they were eaten away by rust? The lucky ones end up with people like Otuts who got this old rusted out Mercury Cougar from his brother in New York and drove it all the way back to Florida. 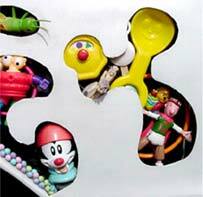 With the help of his other brother, he turned the rust holes into nifty-shaped shadow boxes to fill up with toys. & Full of Toys It Will Be! 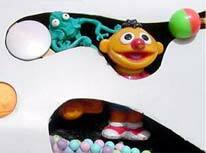 Hence the name "Holey Mercatoy'd"
Looking at the finished car, it is hard to imagine it was once just "full of holes." 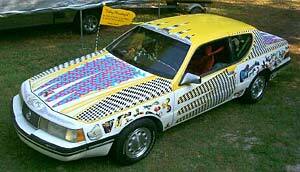 Add a colorful racing style paint job and you have a most unique and playful art car! and see step by step how this great car was created.